The parallel stories of two gay men in a small Texas town. There’s Gabe: a contractor who’s getting over an ill-fated affair with a married man and finds solace in the relationship he still harbors with his ex-wife, Shannon, and their daughter, Cindy; and there’s Ernesto: a Hispanic lumber yard worker in the midst of splitting up with his live-in boyfriend, Luis, as he receives news from the hospital that his former love, Martin, is in a coma. At the end, when Gabe and Ernesto meet each other for a one-nighter–having endured all the struggles and heartbreaks and wondering if they’ll ever find love again–they face the possibility that they might just be meant for each other. 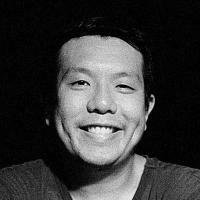 Yen Tan is a Malaysian-born and Austin-based writer, director and graphic designer. His award-winning feature, "Ciao", was released theatrically in 2008. He has designed numerous posters for films that screened at Sundance, SXSW, Cannes and Toronto. "Pit Stop", a script that was workshopped at the Outfest Screenwriting Lab, is his third feature.